Simply viewing the gallery of previous clients will have you convinced that Wedding Makeup By Michelle is the right choice for your big day. There is no other makeup artist in New York City, NY that provides the same level of flexibility in addition to impressive quality. Speaking directly to this artist will show you just how easy it is to work with Michelle and also how affordable her services can be. There really is no better option for your wedding day. The majority of makeup artists in the New York City area are more worried about their reputation than their clients. Amanda Christan Burran started her service so she could provide brides with the complete opposite. From the moment you call to the final touches being applied Amanda will make sure you feel completely comfortable. She wants you to feel absolutely beautiful and even includes a touch up kit with your lipstick color and powder, although with her techniques she provides a look that almost seems like it was completed with permanent makeup. With two decades worth of experience in the makeup industry, Rosemarie Pomilla, the owner and head makeup artist of N.Y. Prostyle Bridal LLC is one of the top choices for brides in New York. There is a long list of celebrities that Rosemarie has provided her services to and this is only a small insight into the vast number of clients she has assisted. While Rosemarie may be highly professional she strives to keep her prices affordable so that her services are available to brides throughout New York City. Grace has had a love of makeup and stylish looks since she was young and this has transformed into a fully-fledged passion and successful career. 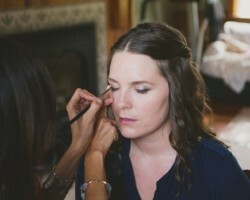 She is now fully licensed and offers some of the most incredible wedding hair and makeup in the whole of New York City. In addition to being talented at what she does, Grace is also an expert in making you feel completely at ease on your big day. For a makeup artist that ensures your day is all about you, there is no better option than Beauty With Grace. There are very few New York City makeup artists that really understand their clients and Karina is one of them. Understanding the needs of the city’s residents means that when you go to Beauty By Karina for your bridal makeup you will immediately see the difference in quality and experience. Karina’s gallery of previous brides she has worked with serves better than reviews to recommend her work, as soon as you see the stunning results you will be immediately convinced that she is the best.